Electrical Services – Hi-Line Electric, Inc.
Our services encompass a wide range of work. Residential projects include new homes and remodels. Some examples of commercial and industrial projects are water treatment plants, lift stations, commercial steel buildings, grain elevators, apartment complexes, restaurants, and churches. Agricultural work involves everything from bin sites to buildings. We also provide service work on a large and small scale. Hi-Line Electric, Inc. has experience in everything from a basic remodel to new, multi-family and custom homes, as well as condominiums and townhouses. Our experienced electricians are well trained and have a wide range of product knowledge and can offer suggestions to design a home especially for you. We are willing to help you with all of your residential needs. Hi-Line Electric, Inc. has done electrical contracting for a wide variety of new construction and remodel projects: water treatment plants, concrete plants, grain elevators, restaurants, medical clinics, and travel centers. We’ve worked with Western Area Power Association, Army Corps of Engineers, and various engineering firms in the water plant industry. 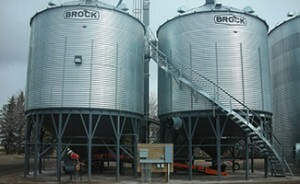 Hi-Line Electric, Inc. has experience with grain bin sites, motor controls, grain dryers and VFDs. We have worked with farmers making their shop and office spaces work for their specific needs.